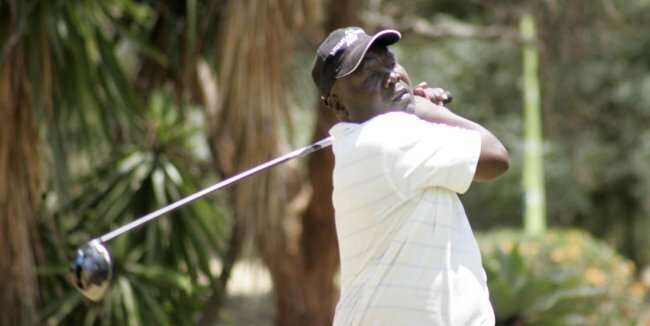 After four days of brilliant displays, Mumias long-hitter Dismas Indiza savoured sweet victory as the opening leg of the 2015 KCB Golf Tour came to a dramatic end at the par 72 Royal Nairobi Golf Club yesterday. The Mumias man who pocketed Ksh. 195,000 prize money achieved the feat despite trailing Richard Ainley by six shots at the halfway stage and eventually beating Bryan Njoroge by one shot! Indiza, who has participated in two Sunshine Tour pre-qualifiers in George and Johannesburg courtesy of KCB sponsorship, had his campaign in the 72- hole event effectively sewn-up when early leader Richard Ainley posted another bad round of 3 over 75 on the last day. Indiza's rounds of 71, 71, 69 and 70 over the past four days were all that he needed to rack up a spirited 7 under par 281 gross victory. Nevertheless, he candidly admitted having to contend with early scares from Ainley. And Indiza did it in bravado despite beating Vet Lab's Brian Njoroge by a solitary shot. While all eyes were directed towards the rivalry pitting Ainley against Indiza, Njoroge had the best round in yesterday's play when he returned a score of 5 under par 67 for a gross total of 6 under par 282. "It was really scary when Richard opened a six shot lead on Wednesday. But after we tied on 5 under at penultimate stage, I knew the situation was manageable going into the last round. And after sinking in an eagle and 3 birdies in the first nine, I knew I had finished Richard completely not knowing that Njoroge was slowly making strides to the top," said Indiza. A crestfallen Ainley settled for third overall position with a total score of 2 under par 286. Ainley got a cash award of Ksh. 100,000 which was indeed a good consolation for his woes over the past two days. Boniface Simwa, who qualified for the Kenya Open at penultimate stage, finished fourth on a total of 1 under par 287. Simwa pocketed Ksh. 95,000. Greg Snow played a total of level par 288 to end up in fifth place. Snow collected ksh. 90,000. Indiza picked up an eagle on the par five hole 7 and sunk in a total of four birdies on holes 2, 3, 5 and 14. He dropped three shots in the second nine though. Ainley dropped four shots on holes 2, 6, 7 and 16. The next round of the KCB Golf Tour heads to Thika Sports Club next month. KCB Corporate Golf tournament wraps up the Royal tour today (Saturday) with over 200 amateurs expected to grace the occasion. 1= D. Indiza 71, 71, 69, 70 (281) -7 2.